Lately there has been a real storm of standalone HD video players appearing on the market that can support 3D video playback as well s 2D, all thanks to the Realtek 1186 media processor that provides the 3D support. And yet another company called AC Ryan is also launching their 3D-capable player called Playon!HD 3D Player on the local market in Singapore this month, hopefully to soon follow with release on other markets as well. 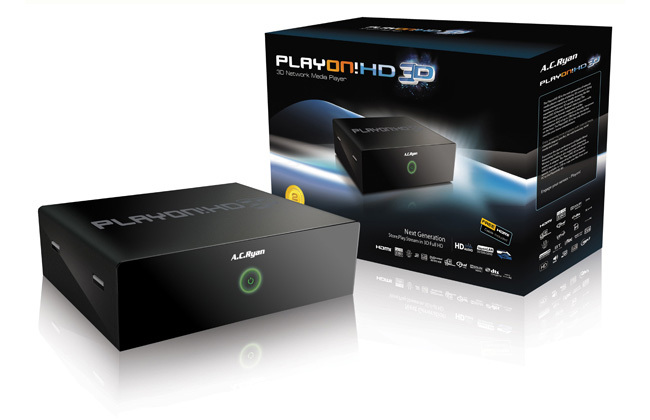 The AC Ryan Playon!HD 3D player is based around Realtek’s 1186 media processor that provides support for the most commonly used media formats including the popular stereoscopic 3D formats as well. The player comes with Gigabit Wired Networking and a built-in wireless-N adapter for fast network transfers. The devices comes with 4 USB 2.0 host ports for connecting external devices such as keyboard as well as a USB 3.0 slave port for faster transfer speeds. You of course also have the ability to use the EZ Drive HDD slot for inserting a 3.5-inch HDD drive inside the device for storing your data. But now, back to the 3D features of the Playon!HD 3D player. The device apparently will support HDMI 1.4 frame packaged 3D output, ensuring compatibility with different stereo 3D capable display devices such as most 3D HDTVs and many 3D-capable projectors. The player is supposed to be offering support for 3D Blu-ray (ISO files as the device does not have an optical drive), 3D AVCHD, Side by Side and Over/Under format videos as well as even be able to do 2D to 3D realtime conversion of videos. The suggested retail price for the Playon!HD 3D player is $249 Singaporean dollars or around $199 USD. Meanwhile there are other 3D-capable video players based around the Realtek 1186 chip, so if you know another good one that is widely available you can share it here along with your feedback from the device. For example other similar 3D-capable players are Egreat R6S, Egreat R300, Fantec 3DFHDL, Himedia HD900B, Himedia HD910A, HDPro-i6, Measy X5, Xtreamer SideWinder 3 and others. Looking over the names of these devices you’ll see that still none of the more popular brands making such products still hasn’t offered a 3D-capable solution, it is mostly less known Asian brands. Over the last few weeks, NVIDIA has successfully demonstrated playback of 3D content encoded with the AVC Multi-View Codec (or AVC-MVC), the codec that is expected to become the foundation for how 3D content is encoded onto Blu-ray discs. 3D Blu-ray content encoded in AVC–MVC can be decoded in real time on select NVIDIA GPUs — resulting in a home 3D experience that is equal to or better to what is offered in movie theaters today. NVIDIA GPUs that can decode 3D Blu-ray content include the GeForce GT 240 ($99 U.S. MSRP), as well as upcoming next-generation GF100 GPUs based on the NVIDIA “Fermi” architecture. This will allow consumers to build desktop PCs powered by GeForce GPUs and NVIDIA 3D Vision active shutter glasses for under $1000 in total, making them the ideal platform for watching 3D Blu-ray movies, viewing 3D photographs, browsing 3D Web sites, or playing more than 400 PC game titles in 3D. NVIDIA will be demonstrating 3D Blu-ray playback running on NVIDIA GPUs and NVIDIA 3D Vision technology at the CES trade show in Las Vegas from January 7 to 11, 2010. If you are visiting CES, you shoudl be able to see 3D blu-ray demo on Nvidia’s booth #35912 in the South Hall 4. Few days ago AMD also announced that it plans to demonstrate the new Blu-ray 3D standard that is “due to arrive on commercial discs in the second half of 2010”. It seems that AMD has partnered with CyberLink to do a preview of the Blu-ray stereoscopic 3D technology during the 2010 Consumer Electronics Show. But unlike NVIDIA’s 3D Vision, AMD hasn’t got its own stereoscopic 3D hardware to present with and there is no information regarding the availability of GPU-acceleration of the AVC-MVC decoding process on ATI GPUs. AMD will be located in the Grand Lobby (GL-8 and GL-10) of the Las Vegas Convention Center, so you better go and take a look if you are visiting CES for more information. Some more good news for next year as Sony and FIFA announced an agreement for selected media rights of the 2010 FIFA World Cup in 3D. FIFA is to produce the world’s first FIFA World Cup in 3D with up to 25 of the 2010 FIFA World Cup South Africa matches being produced using Sony’s 3D professional cameras, which will provide coverage of the action that is unprecedented in depth, vividness and excitement to people around the world. – During the 2010 FIFA World Cup, FIFA will host the “International FIFA Fan Fest” public viewing events in 7 cities around the world (Berlin, London, Mexico City, Paris, Rio De Janeiro, Rome, and Sydney). At Sony’s commercial displays located within the “Fan Fest,” people will be able to enjoy and experience promotional highlight trailers of the FIFA World Cup in 3D. 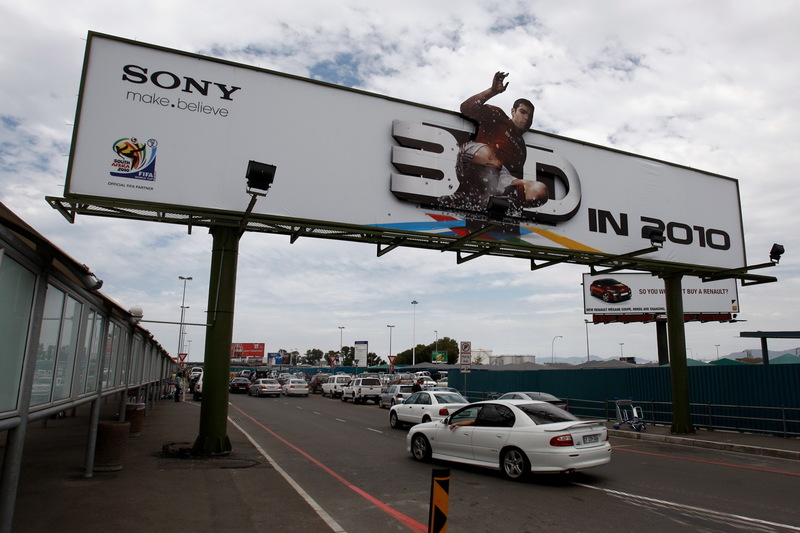 – In anticipation of the Official 3D Film, viewers will be able to watch promotional trailers for the film of the World Cup in 3D at retail outlets (including Sony stores) that sell Sony products around the world. – Sony Pictures Home Entertainment plans to produce and distribute the Official 3D Film on the Blu-ray Disc and other formats.